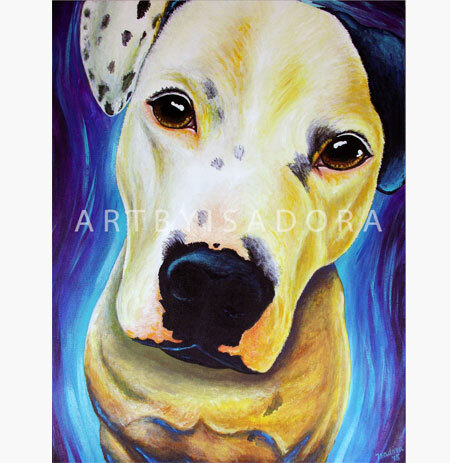 I don't do sales very often, but I'm doing one now… that means that my pet portraits, prints, hand-painted tote bags, hand-painted jewelry boxes, and original art are ALL on sale! 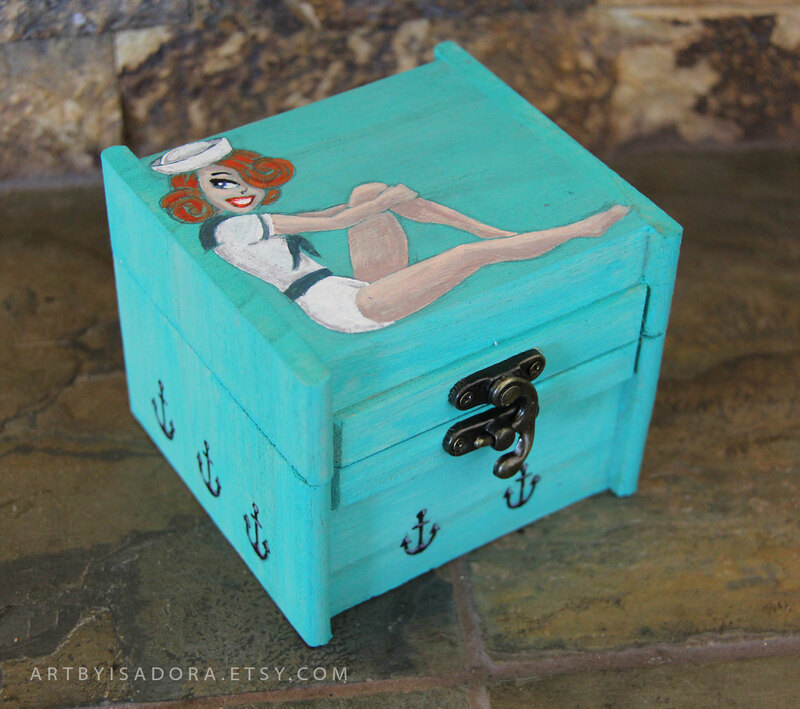 Check out my Etsy store at www.artbyisadora.etsy.com to browse all of the awesomeness that you an save on. For the month of April, everything in my Etsy shop is 10% off when you use the coupon code SPRING at checkout! 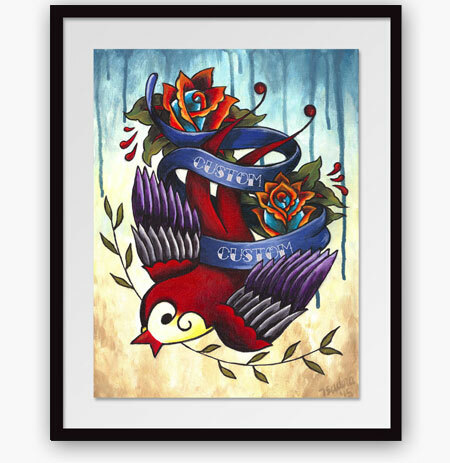 Check out some of the great items I have on sale. 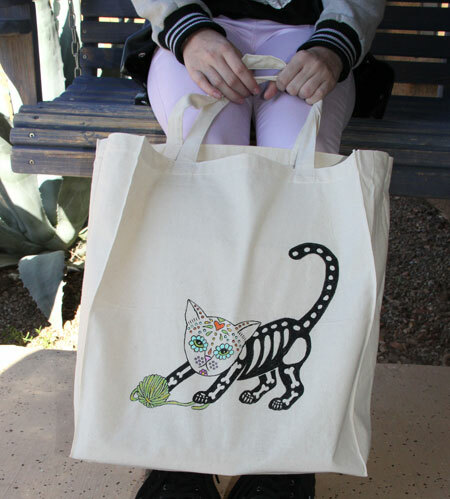 If you see something you like, click it and it will take you right to that item in my shop! 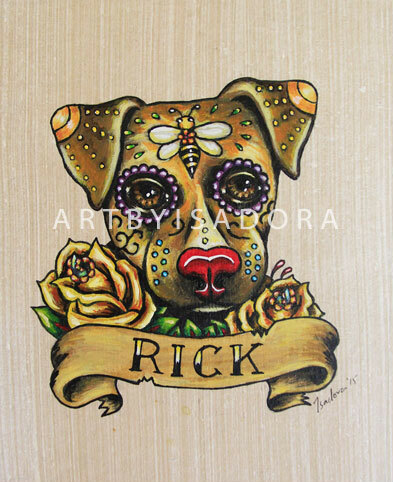 Custom Pet Portraits Make Great Gifts! When it comes to people who adore their pets, you know what kind of gifts they treasure most. Gifts that relate to their pets! Even better are personalized pet gifts. The challenge can be finding items they don't already have, and ones that will last a long time. The best gift for the dog, cat or horse lover in your life (or bird, reptile, you name it!) may be a portrait of their pet. Looking at the responses I've received from some of my clients who have commissioned a portrait of a friend or loved one's pet, it's a surefire win in the gifting department! Click here to order a portrait! "When I saw the painting for the first time I was amazed and knew my wife would love it… [it] even brought her to tears. This one painting symbolizes so much for me, my wife and our puppy Rey…"
"Beautiful. I couldn't think of a better way to honor the memory of my dog… I love it!" "Such wonderful paintings! I can't wait to order more!" "Perfect gift for a family that recently lost their pet." If you'd like to order a portrait, the process is easy and fun! Click here to view available sizes and pricing details. You can also give a gift certificate for a portrait to allow your friend or loved one to be a part of the process as I create the painting. Bottom line: the perfect gift that will last a lifetime is a click away. How easy was that? 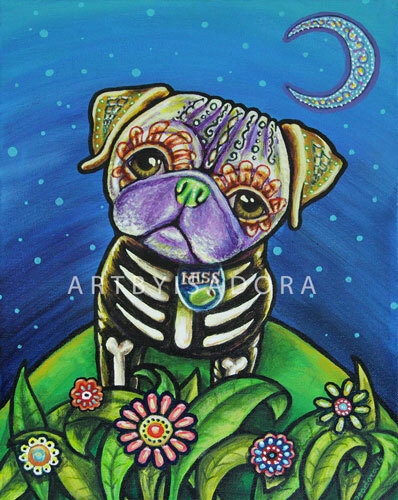 Ordering a custom painting of your pet in three easy steps! Choose the style of portrait you'd like. Options range from colorful and contemporary, to stylized and dreamy. Take some great reference photos of your pet. A few tips are to get out into natural light, or take the photo by a window, and get down to "pet level" for the photo (often this means sitting or kneeling down on the ground to take the photo). Send quite a few photos to give me lots of images in my "tool box" from which to work! Let me know all about your pet. I want to know the quirks that make your pet unique, and stories that illustrate your pet's personality are fantastic! Again, this gives me a nice, full tool box while I'm working on your portrait! My goal is to make the painting or drawing "breathe" with the life of your pet, and every detail you provide adds to my ability to do so. That's it! The rest of the process is up to me. I'll send you sketches, color swatches, and will keep you in the loop along the way. Please let me know if you have any questions at all. I look forward to working with you to create a piece of art your family will cherish! 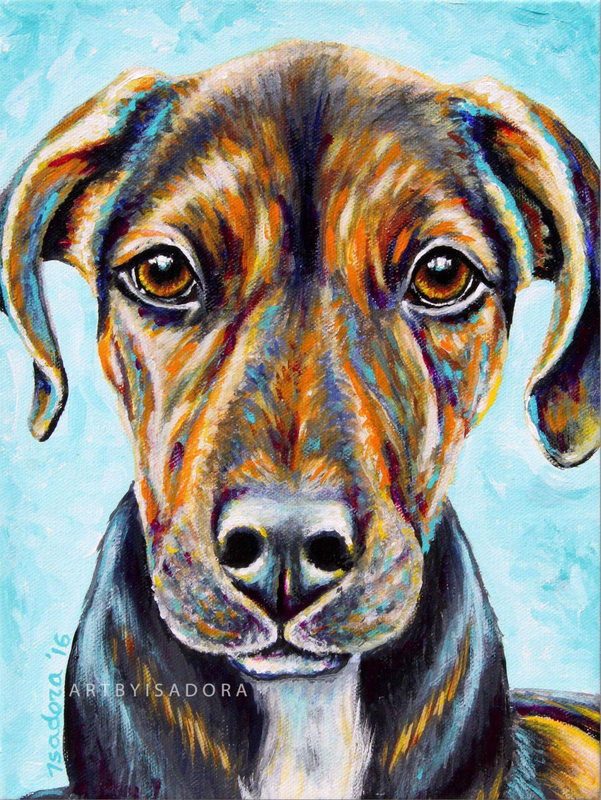 Bold and colorful pet art… I love it! It is just super-fun to paint portraits of people's pets using a lot of color, movement and fun styling in the painting. 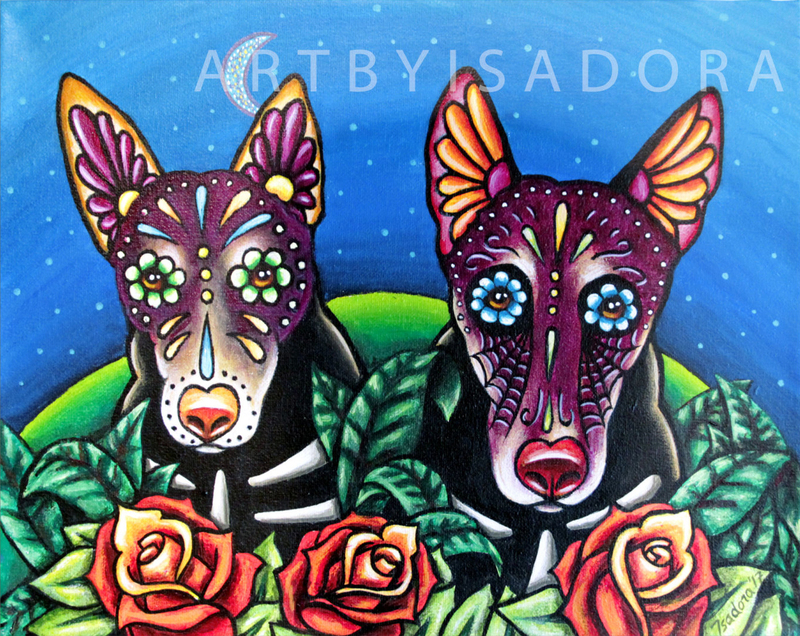 While I also will happily paint in a subtler palette if that's what appeals to a client (after all, their happiness is absolutely my top priority), I do have a lot of clients come to me asking for colorful, whimsical, surreal and dreamy portraits of their pets. It's a little something I offer that is different from other portrait artists, and that is special. 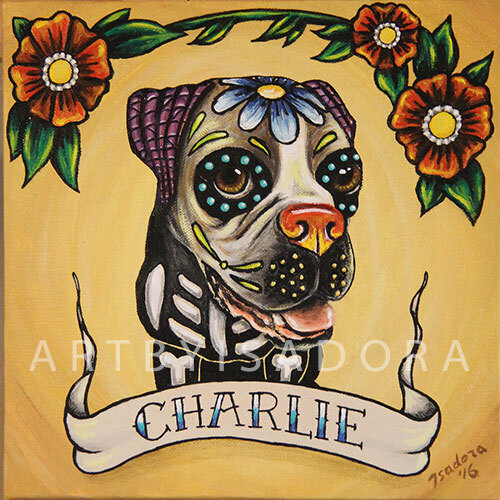 When it comes to my Day of the Dead styled paintings, color is just naturally a part of that art's style. But in my contemporary pieces, it can always come into play as well. Color-lovers, enjoy! 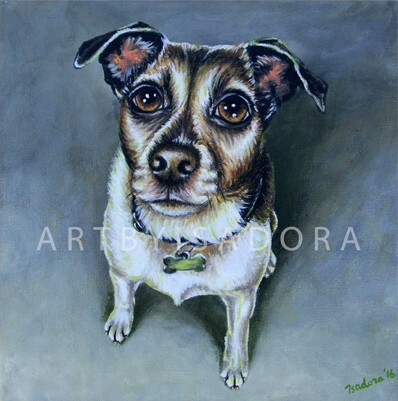 When you google the term pet portraits, you find pages upon pages of talented artists offering their services. It's amazing. On one hand, I am thrilled to see so many artists out there doing it. Hooray for artists working! I wish every single one of them success. On the other hand, it of course begs the question, "Well then, what can I bring to the table, with so many others out there already doing what I want to do?" My animal portraits are different than any of the other pet portraits I've seen. They are bold, contemporary and colorful, and have a style all their own. There are several benefits to this. One fantastic one is that when I say I wish competitors success, I can do so honestly, because they're not offering the same product that I am offering. Also, in my work I feel like I'm presenting something fresh and new into the world rather than recreating something that already exists. When you see my work, you know it's my work. It can't be mistaken for another artist's painting. 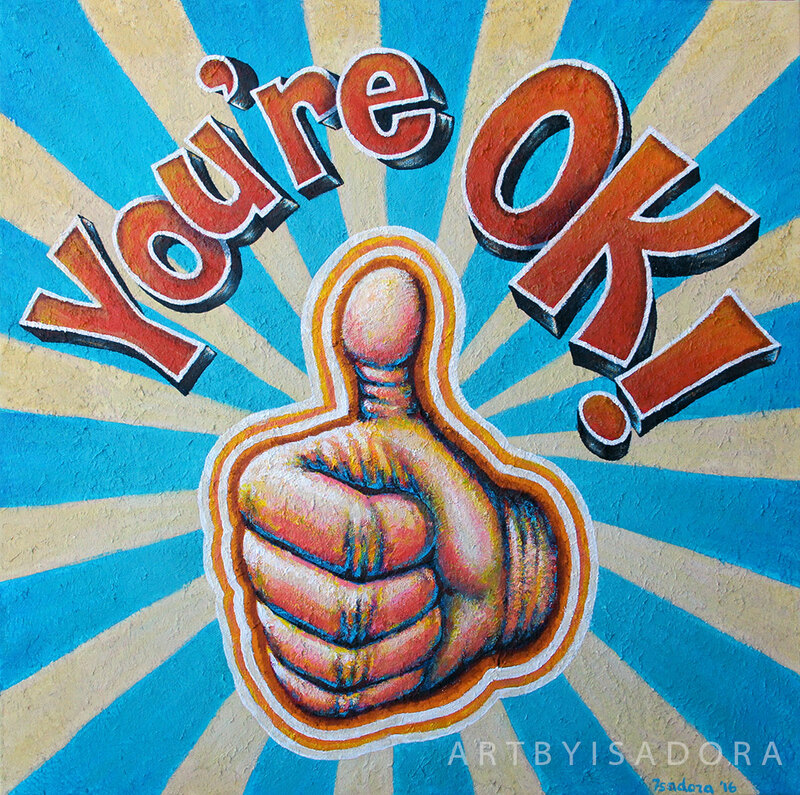 Of course, in being unique, my drawing and painting style may not be everybody's taste, and that is 100% OK with me. For those who are drawn to it, what a fantastic event that is! They found something different and beautiful to them, and it's something that only I an create. Luckily for me, I've had some great success during this first year as a professional pet portrait artist, and have some very happy clients out there enjoying my art. There will always be somebody out there who loves what only you can create. Follow my blog for more art musings, art supplies/product reviews, news about my work and events I may be attending. 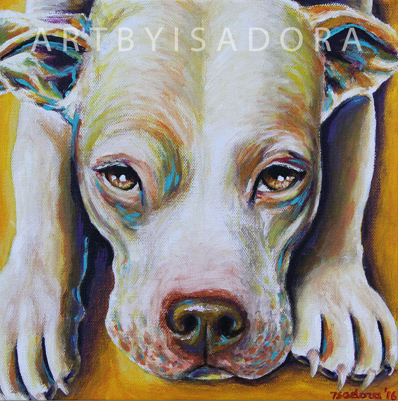 Also, please be sure to check out my Etsy shop at artbyisadora.etsy.com for some amazing pet portraits, tattoo art, hand-painted gifts and more! There are more directions a person can take in life than I can reasonably wrap my head around. A child may dream to be an astronaut, a dancer, a doctor, a race car driver, an architect, a teacher… the list is endless. Hopefully most of you have followed your dreams, or have made some new ones along the way as your life evolved and embraced those. I've chosen to make things. I want to paint, create, imagine and in so doing, make the world a little more beautiful in my own small way. That's why this site exists, and hopefully you enjoy what you see.